Author(s): Jianhui Yuan, L. W. Zhang, K. M. Liew. Department of Architecture and Civil Engineering, City University of Hong Kong, Kowloon, Hong Kong SAR. Background: It has been found that the bilayer structure, especially the bilayer graphenes, can markedly weaken the anisotropy of elastic properties. For tri-layer systems, such as a monolayer grapheme sandwiched in bilayer graphenes and boron nitride nanosheets. The BN-G-BN achieves a more stable combined structure than G-G-G. The results further indicated that the high-temperature distortion resistance of interlayer graphene in the tri-layer complex is related to both material type and constrain conditions at the up-down layers. Methods: The structural stability and high temperature tolerance of bilayer complex nanoribbons are analyzed using the molecular dynamics method. By calculating a variety of potential functions between nanosheets and optimal interlayer distances, the differences in structural stability are examined. By simulating structural performance at high temperatures and analyzing the radial distribution function (RDF) and deformation electron density, the hightemperature distortion resistance is researched. Results: The optimal distances between layers are approximately 0.359 nm for bilayer borophene (B/B), 0.340 nm for bilayer graphene (G/G) and 0.348 nm for the hybrid bilayer (B/G). Analyzing of the results of the binding energy, interaction energy and van der Waals energies between nanosheets revealed that the structural stability of the bilayer complexes from high to low in turn are B/G, B/B and G/G. The dominant interaction sustaining complex stability is a typical van der Waals interaction. The structural analyses on the above complexes at high temperature (1500 K) indicated that the hybrid bilayer nanosheet B/G, in the three bilayer complexes, has the highest temperature tolerance, followed by G/G and then B/B. Conclusion: The results indicated that the bilayer borophene, especially for hybrid bilayer nanosheets, can help to improve the structural stability. The results revealed that the excitation of a greater number of local electrons in borophene results in the high temperature deformation resistance of B/B being inferior to that of G/G. The B/G, in three bilayer complexes composited with graphene and borophene, has the best structural stability and the highest temperature tolerance. Keywords: Bilayer nanosheets, graphenes and borophene, high-temperature deformation, molecular dynamics, structural stability. Affiliation:Department of Architecture and Civil Engineering, City University of Hong Kong, Kowloon, Hong Kong SAR. Keywords:Bilayer nanosheets, graphenes and borophene, high-temperature deformation, molecular dynamics, structural stability. Abstract:Background: It has been found that the bilayer structure, especially the bilayer graphenes, can markedly weaken the anisotropy of elastic properties. For tri-layer systems, such as a monolayer grapheme sandwiched in bilayer graphenes and boron nitride nanosheets. The BN-G-BN achieves a more stable combined structure than G-G-G. The results further indicated that the high-temperature distortion resistance of interlayer graphene in the tri-layer complex is related to both material type and constrain conditions at the up-down layers. Methods: The structural stability and high temperature tolerance of bilayer complex nanoribbons are analyzed using the molecular dynamics method. By calculating a variety of potential functions between nanosheets and optimal interlayer distances, the differences in structural stability are examined. By simulating structural performance at high temperatures and analyzing the radial distribution function (RDF) and deformation electron density, the hightemperature distortion resistance is researched. Results: The optimal distances between layers are approximately 0.359 nm for bilayer borophene (B/B), 0.340 nm for bilayer graphene (G/G) and 0.348 nm for the hybrid bilayer (B/G). Analyzing of the results of the binding energy, interaction energy and van der Waals energies between nanosheets revealed that the structural stability of the bilayer complexes from high to low in turn are B/G, B/B and G/G. The dominant interaction sustaining complex stability is a typical van der Waals interaction. The structural analyses on the above complexes at high temperature (1500 K) indicated that the hybrid bilayer nanosheet B/G, in the three bilayer complexes, has the highest temperature tolerance, followed by G/G and then B/B. Conclusion: The results indicated that the bilayer borophene, especially for hybrid bilayer nanosheets, can help to improve the structural stability. The results revealed that the excitation of a greater number of local electrons in borophene results in the high temperature deformation resistance of B/B being inferior to that of G/G. 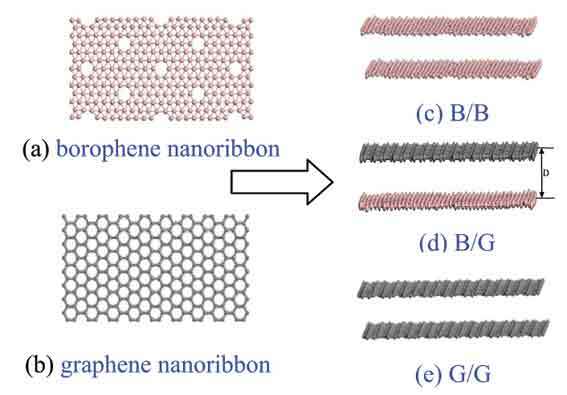 The B/G, in three bilayer complexes composited with graphene and borophene, has the best structural stability and the highest temperature tolerance.